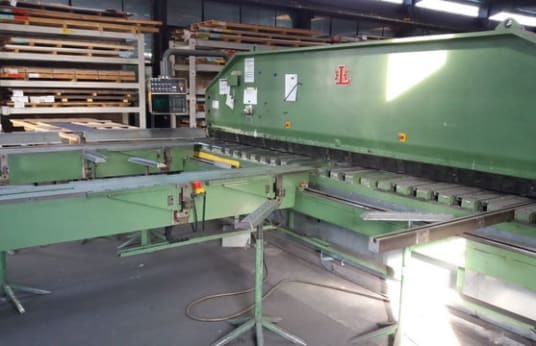 Cutting length 5000 mm, passage between the stands 5040 mm, cutting performance at a sheet strength of 450 N/mm² 4.0 mm, cutting performance at a sheet strength of 700 N/mm² 3.0 mm, adjustable cutting angle 0° 41 min to 1° 13 min, cutting speed depending on cutting angle 19 to 28 strokes/min, column projection 90 mm, number of hold-down cylinders 25, distance between hold-down punch centre and cutting line 58 mm, cutting gap adjustment manually via tension and compression screws, rear backgauge programmable via X 3 of DNC control, backgauge depth 1000 mm, motor power 12.5 kW, machine equipped with CYBELEC control DNC 70, programmable backgauge range 1000 mm, discharge belt, angular backgauge and support arms, working height on steel girders 1420 mm, alternatively foundation opening approx. 320 mm deep, possible working height 900 mm. The machine can be transported with a mega trailer (loading height 3000 mm).